Select Option HO9805 - Large 32 Oz. HO9814 - Medium 18 Oz. 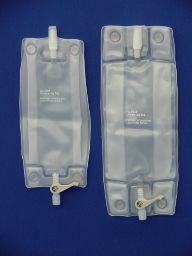 Sterile, pleated latex-free vinyl bag with Flip-Flo™ drain. Choose your size above. THE LAST THREE OF THESE THAT I PURCHASED DEVELOPED A LEAK IN LESS THAN A WEEK. THE LEAK WAS IN THE PLEAT. SINCE I HAVE AN INDWELLING FOLEY I CAN NOT AFFORD TO HAVE TO BUY A BAG EVERY WEEK. Ordered for my husband who has a foley catheter. We do not like the cheap bags that he gets from VA!